Generations after the Spirits abandoned the world, two mortal empires stand on the brink of a final battle to end a centuries-old conflict. Ayons in the north, Ronnesians in the south. Washed up on the shore of a foreign land, Angora is thrust into a war not her own. Proclaimed one of twelve legendary mages – representatives of the Spirits – she is charged with protecting the innocent with magic beyond her imagination. However, when her allies mercilessly misuse their own powers, she begins to wonder which side of the conflict is the more righteous. After the abduction of their ruler, the Ayons launch an invasion capable of destroying the Ronnesians once and for all. As the war rages on, Angora's friends fight bravely as strongholds fall before the mighty crimson wave of the Ayon army. But when all seems lost for the Ronnesians, a spark of hope is found in an infamous assassin and a fragile rebellion rising from the dust. I began reading Equilibrium when the first instalment was offered on Netgalley and have been hooked, working my way through the first four episodes as they released. When the complete edition came up, I celebrated with cake and requested it. Episode 5 will be out this week and 6 two weeks after that. 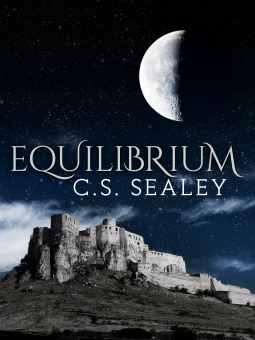 In Equilibrium, Sealey shares her amazing rich and balanced world in six parts if you go through the serialized version. Each Episode is in itself a great story with a huge cliff-hanger, which I loved. Knowing the next instalment was just a couple of weeks away only added to the tension of the wait. I also love Sealey's writing. She easily immersed me in the story without overloading detail or losing me in overdone descriptions. I became fond of so many characters on both sides of the conflict. Some I lost, some surprised me. All were well developed. Even secondary characters brought much to the story and remained memorable and true throughout the book. Equilibrium is one of my very top 'sword and castle' fantasy finds of the past few years. The richness of character, detailed scope of setting and consistent storytelling voice set Equilibrium apart for me. So very fitting Equilibrium ends with wind and water. Not the violent clash with which it begins but instead something soft and final. I think I held my breath through the last dozen chapters to the point where drawing a full breath hurts. Thank you to Netgalley and Momentum for the opportunity to read Equilibrium.